Lorinser Tunes C-Class Up To 305 HP, Makes It "Hot"
According to the press release from tuning shop Lorinser, the Mercedes C-Class is "hot" now that they've had their way with it. The tuner apparently used a beefier cam in conjunction with revised engine management to squeeze 33 extra horsepower out of the new Benz, rather than going the turbo route as they did on the Lorinser Smart ForTwo. A lowered suspension tightens up handling and a tuned exhaust combines with exterior badging to let everyone know that you're hot. Check out the "hot" press release below, complete with bonus heat metaphors. Lorinser makes the C-Class "hot" with 305 HP Digital revolution renders classic engine tuning more effective than ever Hot camshafts? In the age of chip tuning, that sounds like a relic of the Eighties. Incorrectly, as there is not much extra power to be gained electronically from a naturally aspirated engine. Mechanical measures continue to be the first choice there, and more effective than ever before in combination with an adjustment of the engine management. One particularly successful example is the C 350 Limousine from Sportservice Lorinser, an almost irresistible temptation for everyone with petrol in their blood: special camshafts and a modified engine control unit kindle here far more fire than the series version of the extremely successful 3.5-litre V6. 305 HP (224 kW) instead of 272 HP (200 kW) are an end result that can be more than seen in a non-charged engine, especially since the fast Mercedes accelerates powerfully with 380 instead of 350 Nm, even at very low RPM. As a result of the tuning measure, the interval between opening the exhaust valve and closing the intake valve becomes bigger. The result is a "hot" overlap, which is where the camshaft modification gets its name from. On the other hand, the Lorinser lowering kit is responsible for the "hot" handling in the bend. An additional bonus in the driving-fun account. Digital or analogue? Music fans may argue about this point, but not car enthusiasts. Of course, the Lorinser sports exhaust system plays music purely mechanically, and develops such a crescendo when the accelerator pedal is pushed enthusiastically that even eardrums get goosebumps. 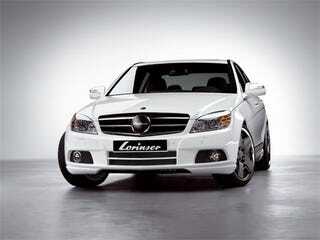 But the optical charms of the C-Class also easily arouse the desire to own one. Is it the well-designed exhaust tailpipes integrated into the Lorinser rear apron that the sporty roof and rear spoiler soar above? The muscular side sills or the striking front apron? An abundance of details that add up to a fascinating automobile. The model RS 8 matt black 19-inch light-alloy wheels draw attention to themselves as they provide exciting contrasts in combination with the white bodywork colour. An additional stylish alternative is the silver-coloured light-alloy wheel RS 9 from the Lorinser assortment. An offer that repeatedly proves in its totality that the Winnenden customiser won't be losing steam any time soon when it comes down to stirring up passions for automobiles.